Every guitar tells a story, from the tonewoods that form it, to the craft of its making, to the players that own it, to the places it visits, and to the many songs that it sings. This blog tells the story of a unique guitar; one that has been created with the express purpose of capturing and telling its own life history. Our guitar is called Carolan in honour of the legendary composer Turlough O’Carolan, the last of the great blind Irish harpers, and an itinerant musician who roamed Ireland at the turn of the 18th century, composing and playing beautiful celtic tunes. Like it’s namesake, Carolan is a roving bard; a performer that passes from place to place, learning tunes, songs and stories as it goes and sharing them with the people it encounters along the way. This is possible because of a unique technology that hides digital codes within the decorative patterns adorning the instrument. These act somewhat like QR codes in that you can point a phone or tablet at them in order to read their codes (see below) which in turn accesses information on the Internet. Unlike QR codes, however, they are aesthetically beautiful and form a natural part of instrument’s decoration. Scanning the different patterns on the Carolan guitar takes you to different information such as the history of how it was made, details of who has played it, videos of their performances and also the instrument’s user guide and full technical specification. 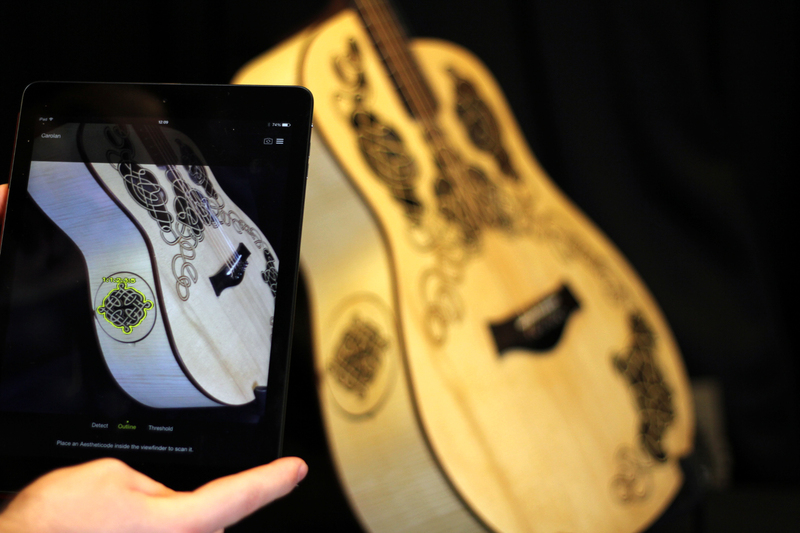 As a result, this unusual and new technology enables our guitar to share a growing ‘digital footprint’ throughout its lifetime, but in a way that resonates with both the aesthetic of an acoustic guitar and the craft of traditional luthiery. 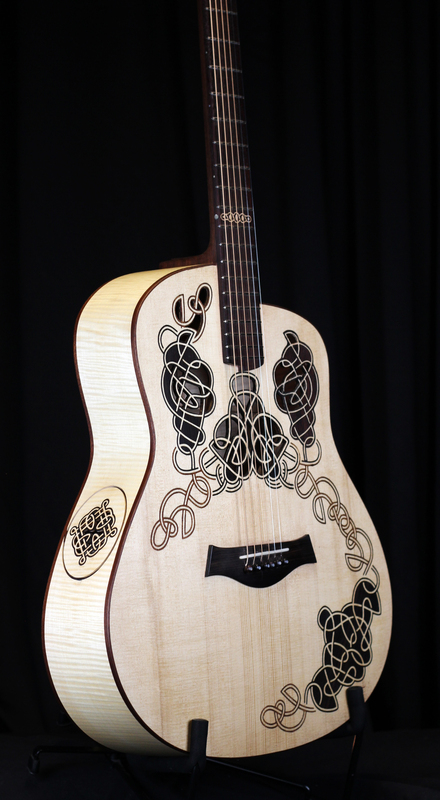 To make such a guitar is a challenging project, one that must necessarily draw together a uniquely skilled team including a luthier, graphic designer, but also computer scientists.